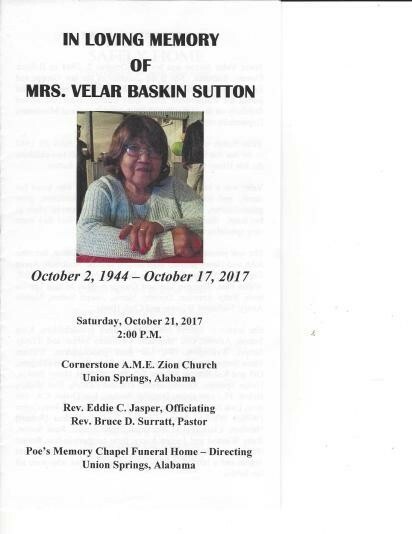 Sister Velar Sutton was born October 02,1944 in Bullock County, Alabama. She is the daughter of the late George and Emma Lou Baskin. She confessed Christ at an early age and joined Cornerstone AME Zion Church were she served faithfully on the Usher Board,Deaconess Board and Missionary Department until death. Velar Suton was united in Holy Matrimony on April 20, 1962 to the late Joe Sutton. God blessed this union with two children, the late Henry(Heather) Sutton and the late John Sutton. Velar was a sweet loving and caring individual who loved her family, and friends dearly. All of her grandchildren, great grandchildren, nieces and nephews had a very speical place in her heart. She had a way of making each one feel they were very speical to her. She was preceded in death by her husband Joe Sutton, her sons John and Henry Sutton, three sisters, Minnie Anderson, Annie Cope and Vertha Faulk, five brothers, John Wesley, Adell, Willie Paul, Tommie Lee and George Baskin Jr. and her in-laws Betty Antwine, Dorothy Harris, Joseph Sutton. Melvin Avery, Nathaniel Winston and Clark Harris.